To submit time spent for the entity you're working on you can start and pause a timer. The Timer is available within Time Tracker Mashup, in Android mobile app, and in Visual Studio add-in. It is also possible to integrate with external services for time tracking. For instance, personal Toggl timer can be integrated with Targetprocess via Zapier data connector. This mashup adds a start/stop time tracking option to the Targetprocess menu bar. This mashup has been contributed by one of our users rather than by Targetprocess developers. Open the entity and tap the 'Track' button that appears next to 'Add Time'. The timer will begin. Once you've started tracking time, you might notice a clock icon over the 'Me' tab. You can always find the currently tracked entity under this tab. You can post or reset your time by tapping on the tracker. When you're done, tap the 'Post time' button. If you want to reject the current time, press the 'Reset' button. You can only track time for a single entity at once. You have to post or reset time for your current entity before tracking a new one. And of course, you can still add time using the 'Add' button. It's easy to track time with the Visual Studio add-in. Just select a Task, and click Start. Time tracking for the Task will start; you can stop and resume time tracking as needed. When you click Stop, you need to enter the details for this time entry. 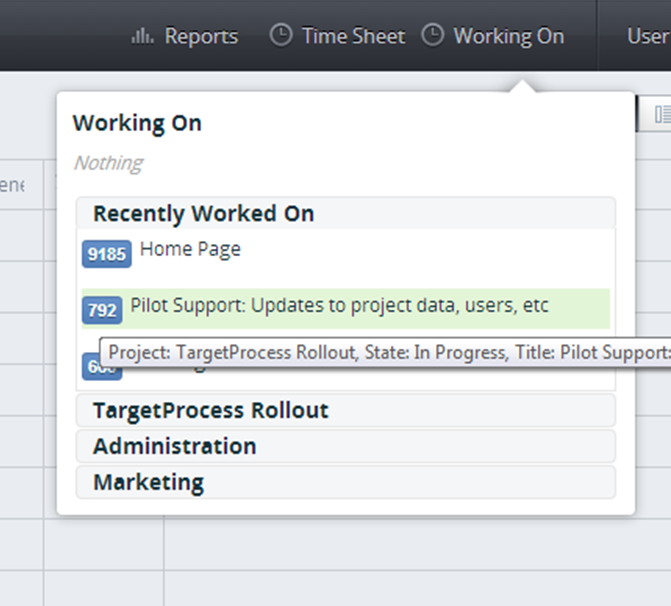 When you’re done working for the day, you can submit all the time entries to Targetprocess. Stop the timer and click Submit Time. Remember to use the Submit Time button. Times are not posted to the server automatically. The time log displays all records that haven't been submitted to the server yet. Each bar is a standalone time record for some work. The length of the bar represents the duration of the activity. The report clearly shows how fragmented your time is. A highly fragmented time record can be evidence of inefficiency/ interruptions/multitasking. You might consider making some adjustments to your work patterns based on that. Find out more about our APIs, Plugins, Mashups and custom extensions. Join our community of passionate users and even discuss directly with our developers. We’ve sent you a confirmation e-mail — please, go check it.